CHRISTINE POULSON » I bought a book! Visiting Cambridge on Friday to do some research for a story, I realise that I should have made an further exemption from my book-buying moratorium: because I can’t be in Cambridge without going to Heffers Bookshop – and I can’t go to Heffers without buying a book. It is one of my favourite book shops, because it has the best crime fiction department anywhere, in my view, and a great fiction buyer in Richard Reynolds. Above all, it has a special place in my heart, because it is the only book shop that, thanks to Richard, has always stocked my novels – actually has them on the shelf – ever since my first one came out in 2002. So I always ask Richard what he’s enjoyed lately and I always buy a book. Well, several usually, to be honest, but this time I resisted 3 for 2 offers and bought just one, carefully chosen book. 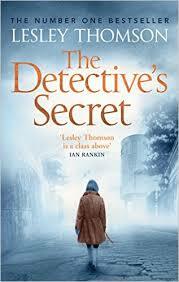 It was Lesley Thomson’s The Detective’s Secret and I picked it because I met someone at a party, who recommended her novels. So you see: nothing is more effective than word-of-mouth. I now have less than two weeks to go on the moratorium, and I’ll report more fully at the end. But I already know it has made me more discriminating and that thinking about whether I really do want a particular book makes me see them as the precious objects that they are. PS. Out with my husband at a Christmas fair, we came across a second-hand book stall and he asked me if there was anything I fancied. ‘I’m still on my moratorium,’ I said rather sadly. ‘Yes, but I’m not,’ he replied. I sympathize, Christine. In Santa Barbara, we have a wonderful independent bookstore and I like to buy books whenever I am there just to support the store. Not only do they have a wondrous selection of mystery novels, but we don’t have any chain bookstores nearby anyway, so I want to help keep them in business. I am sure I can get through a few months without buying from Chaucer’s Bookstore and my husband will buy some books from them in that time, but that will be one place that it will be hard to visit. Looking forward to hearing what you think of the Lesley Thomson book. Thanks, Tracy. Yes, one feels it is almost a duty to keep bookshops like that going. With Christmas coming up, I have been able to buy books as presents from local bookshops, which has assuaged my book-buying yearning and helps to keep them in business. I’ll review the Lesley Thomson in due course. It does look good. Couldn’t agree more about Heffers, and – it is entirely due to them that I started reading your books, which led to our linking up online. So we owe them a purchase or two, don’t we? You were listed in their crime fiction brochure I think, and I liked the sound and found the book on the shelf. I read The Detective’s Daughter by the same author and absolutely loved it, I’ve been meaning to read something else by her. It is rather lovely that we owe our friendship to Heffers! I am saving up my new book to read over Christmas and will probably report back.